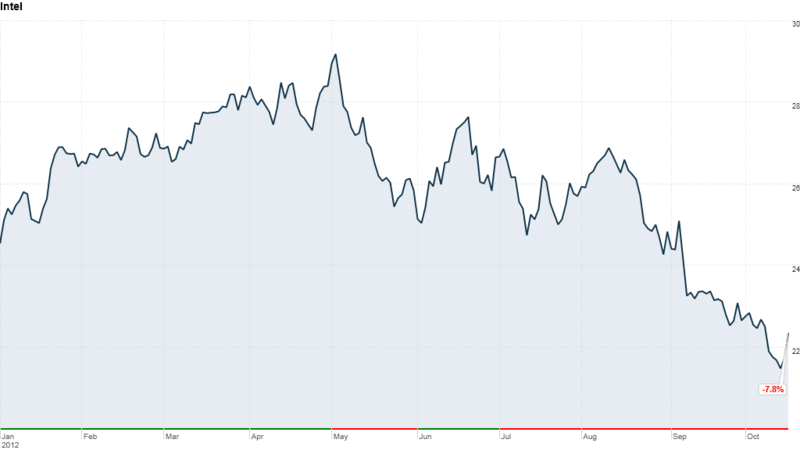 Click the chart to see more information about Intel's stock. Weak PC sales finally caught up to Intel, dragging the chipmaking giant's sales and profits lower in the third quarter. Back-to-school sales typically boost computer demand in the late summer, but a weakening global economy and consumers' shift to tablets cut PC demand to half its third-quarter norm, Intel said. The company's PC chip sales fell by 8% last quarter, in-line with the overall global PC market. For the current quarter, Intel doesn't expect any improvement, anticipating that PC sales will grow at half their seasonal rate. Computer makers are taking a very cautious approach with their inventories as the global economy continues to slump. They are also taking a wait-and-see approach to Microsoft's Windows 8 launch, which will take place on Oct. 26. "Our third-quarter results reflected a continuing tough economic environment," said Paul Otellini, Intel's CEO, on a conference call with analysts. "The world of computing is in the midst of a period of breakthrough innovation and creativity. Intel has a history of navigating industry's transitions and emerging better and stronger." Otellini said he's confident in the company's strategy and prospects for all the markets it serves -- including the slumping PC market. PC sales, which make up about two-thirds of Intel's business, dragged down the company's quarterly results, but they weren't as bad as expected -- still handily beating Wall Street's forecasts. Positive results from Intel's data center unit and a much-more-favorable-than-expected tax rate helped the company beat Wall Street's expectations and hit the high-end of the company's own -- albeit reduced -- forecasts for the quarter. Shares of Intel (INTC) fell by more than 2% after hours. Intel warned investors a month ago that its third-quarter financials would sting, as demand for personal computers had slowed beyond expectations. Intel said corporations are ordering fewer PCs, consumers in emerging markets are sitting on the sidelines, and PC manufacturers are slowing output to meet sinking demand. Worldwide shipments of PCs fell by more than 8% in the third quarter, according to separate surveys by Gartner and IDC, and they are on pace to fall for the full year, IHS iSuppli predicts -- the first time since the dot-com bust of 2001. Still, chief rival AMD (AMD) has fared much worse than Intel. The company warned investors last week that its third-quarter sales would come in lower than expected. Sales have tumbled, and the stock has matched it -- falling by nearly 50% this year. The decline in PCs is also expected to negatively impact other tech companies reporting earnings this month, including Microsoft (MSFT) on Thursday and even mighty Apple (AAPL) on Oct. 25. The world's largest chipmaker said third-quarter revenue was $13.5 billion, down 5% from the same period last year. That topped a median estimate of $13.2 billion, according to analysts polled by Thomson Reuters. Net income for the Santa Clara, Calif.-based company fell 14% to $3 billion. Results included a one-time charge of 2 cents per share. 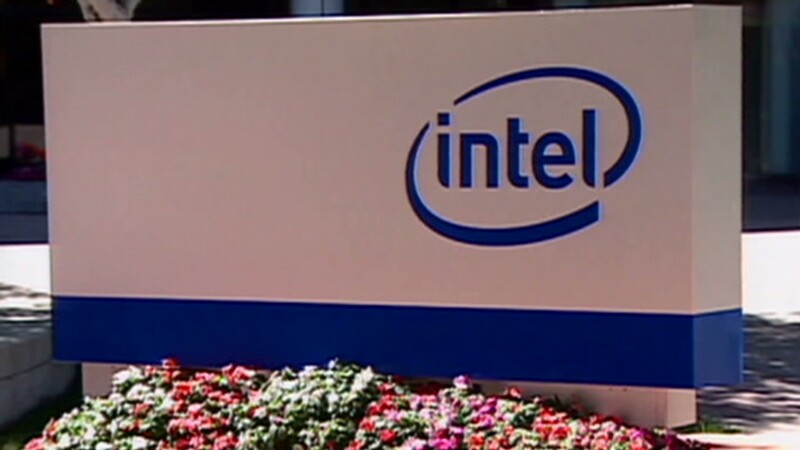 Without the charge, Intel said it earned 60 cents per share. Analysts, who typically exclude one-time items from their estimates, forecast earnings of 49 cents per share. For the current quarter, Intel said it expects sales of between $13.1 billion and $14.1 billion, in line with analysts' median forecast of $13.7 billion. The company's data center chip sales were one of the quarter's lone highlights, rising 6% year-over-year. A tax rate of 24%, better than the expected rate of 28%, also helped.